I'm sure by now that you've heard we've been reading The Iron Man, by Ted Hughes. We love it! This week we have been amazed watching a 3D printer print a mystery object. Can you guess what it is? Look what came out! It's the Iron Man's hand! Congratulations to Ethan, Michael and Jack, who are our champion home readers! They never forget to read at home and always bring in their books to be checked and changed. Well done, boys! Please could I remind parents that all children must read daily for at least 10 minutes. Reading Records should be signed and brought back to school when the book needs changing. Building fluency in reading and understanding a text are crucial skills and need regular practice. Our topic for this half term is based on the book "The Iron Man", by Ted Hughes. In English, we are learning the opening passage using pictures and actions to help us. Here is the passage we are using. Maybe you could practise it at home? 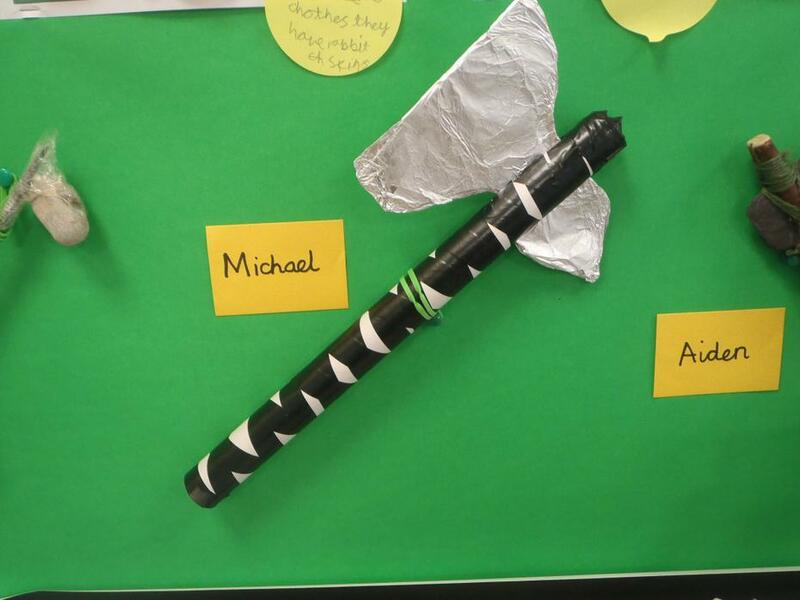 Our new Spring Term 1 topic is called Rock and Roll and we will be heading back to the Stone Age to find out what life was like. Have a look at these websites to find out more. Do you know your 4 and 8 X tables? In 3C we are working hard to learn our 4 and 8X tables. We know a game called "8s" which we can play to help us learn our tables facts. 1. Draw a grid of 8 boxes. 2. Decide which X table you want to practise. 3. Roll a dice and fill up the boxes with X tables answers from the table you chose. 4. Take turns to roll the dice and cross off the answer if it's there on the grid. 5. Whoever gets the most points is the winner! Here we are playing 8s! 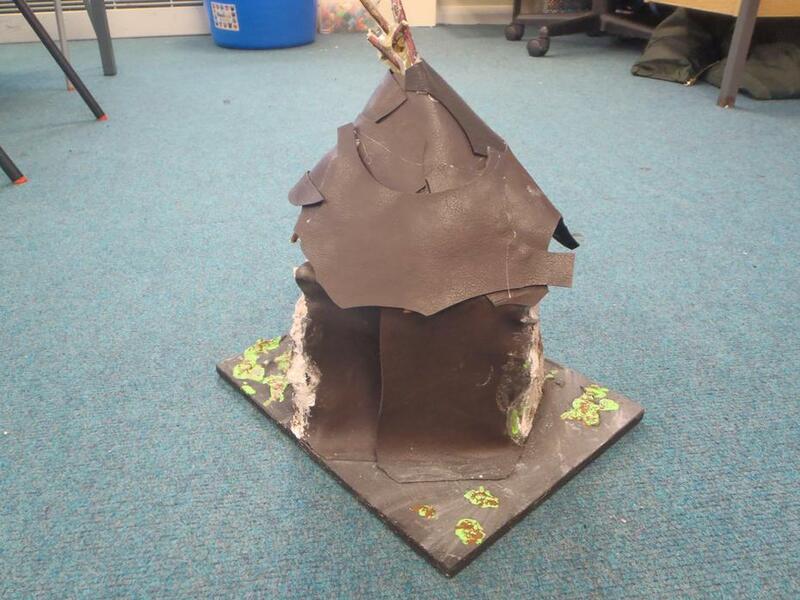 Prepare to be wowed by some wonderful, creative homework! 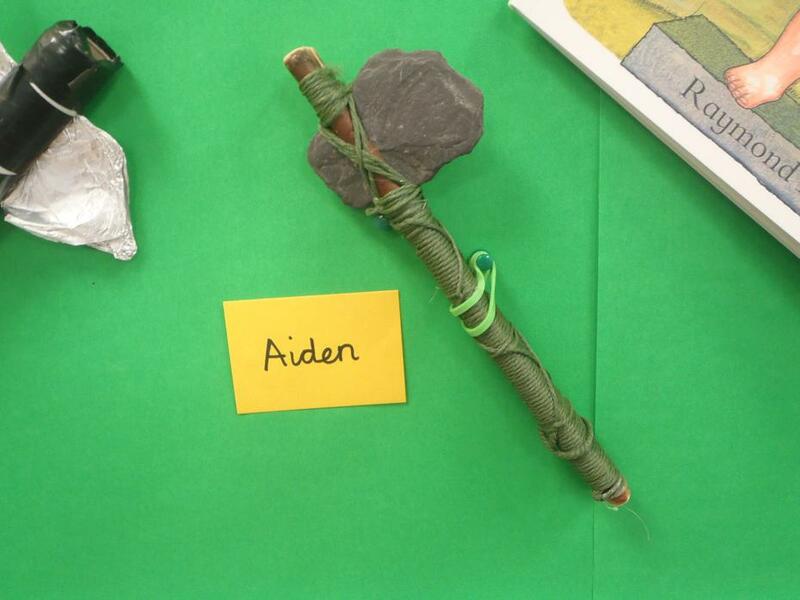 Aiden, Michael and Blake have all made hand axes. 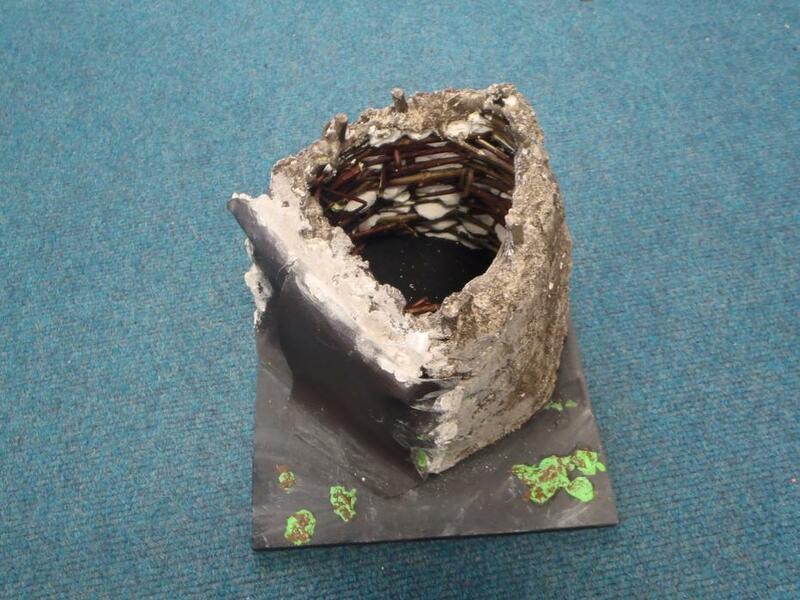 Aiden and his Grandad created an amazing Stone Age house. It even has a cosy bed and fireplace inside! This cave shows the type of dwelling the earliest Stone Age people lived in. As the Stone Age progressed, the houses changed. We're finding out lots of information in our Guided Reading this week. Ask us what we've found out! Congratulations to Leon L, who was the first person to scan the code and find out that it was Stonehenge! If you can't scan the QR code, click on the link below and find out about this special place. Stonehenge English Heritage website. Find out why Stonehenge is so special. How was life different compared to today? DK Findout website about the Stoneage. Scan this QR code and find out about a mystery location. Why is it special for our topic? Tell your teacher what you find and earn a prize! Naughty Norman has arrived in 3C! Last Friday, we received a letter through the post from an elf called Norman. He said that he has been watching us at school since September and wanted to come and stay with us in 3C. He even left us a reply slip which we had to pin to the washing line! On Monday morning, we spotted Norman hanging on the washing line. He is so cute and cuddly! 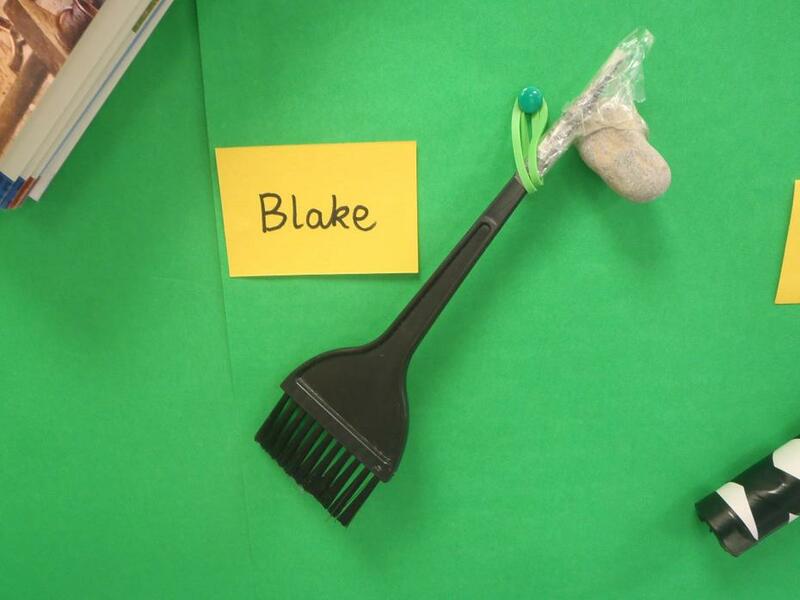 On Tuesday, we couldn't spot where he was until we started our Vocabulary Challenge. Look what he'd done on our flipchart! What a cheeky elf! We're learning to tell the time! In 3C we are learning to tell the time, using words such as past, to, quarter and o'clock. Here is a link to some fun games which will help you to tell the time. Learn to Tell Time using a Quarter Past, Half Past, and a Quarter To! Enjoy telling the time with our learning videos for kids analogue clock and digital clock series! Learning Time Fun has created multiple clock videos for kids, and we look forward to creating more in the future! This is a song about telling time by the hour. Hip Hop Around the clock and tell the time by the hour. LYRICS: Hip-Hop Around the Clock Hip-Hop Around the Clock Hip-Hop Around the Clock When I say the time you stop If you're at the time you say Hip-hop, Hip-hop, then the time on the clock. In 3C we love singing! Here are some catchy songs to help you to remember what we've learned in our Grammar lessons. The Subordinate Conjunctions song! Listen to this catchy song about conjunctions! The Prepositions song! Here's a song about prepositions for you to sing along to. The Adverbs song! Listen to this song and find out more about adverbs. In 3C, we regularly use a website called Times Tables Rockstars to build up and knowledge and speed in recalling times tables facts. We all have our own username and password, which can also be used at home. As the login links to our school, the children can only play against other members of our class and there is no option to contact other members. We love it! What does this plate show? Why are the sections different sizes? This half term we are going to be learning about what it means to have a nutritious, healthy diet. This is called a balanced diet. We will be putting our knowledge and skills to the test and designing and making our own healthy snack. Myself, Mrs Bell and Mrs Bates welcome you to our part of the Meadowhead Junior School website. We hope to post lots of information about what we're learning, what we've been up to and information to help you to know our daily routine. As always, pop in to see me or ring school if you have any questions or concerns. This is a timetable of our week so that you will know what we do each day and what you need to get ready. This is a list of statutory words which Year 3 and 4 children are expected to read and spell. We practise these words every day but any help and support you can give at home will be very welcome. What are these wooden shoes called? Why do they link to our Local Area topic?